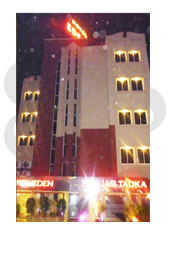 Palkee (A & B) : The great banquet hall that is spacious, airy ,grand and can accommodate 150-600 Persons. We offer prize winning catering and contemporary ballroom tailored for all your social occasions. Excelling the standards for all exceptionally delicious cuisine, Hotel Eden gained instant popularity among Ahmadabad’s banquet halls. It ascertains modern luxurious criterion, with fashionable modernistic and vivacious structures. Therefore, don't look any further if you are in need of banquet hall. So, come here for full entertainment and comfort. An exclusive multi-cuisine restaurant that promises to serve and provide plentiful mouth watering dishes ,both vegetarian and non-vegetarian in assortment of Indian, South Indian, Chinese and Continental cuisines. Nevertheless, the restaurant offers a blend of Indian classical dishes as well as new innovative creations from across the nation. These dishes are sure to arise and awaken one’s taste buds. Each dish is a craft in itself with diverse and unique flavors. The Punjab Tadka Restaurant promises to retain the Indian traditional way of cooking. The dining room surely captures one’s senses with its wholesome menu. It knows how to party. One feels very happily surprised at how little it costs to serve the very best food.